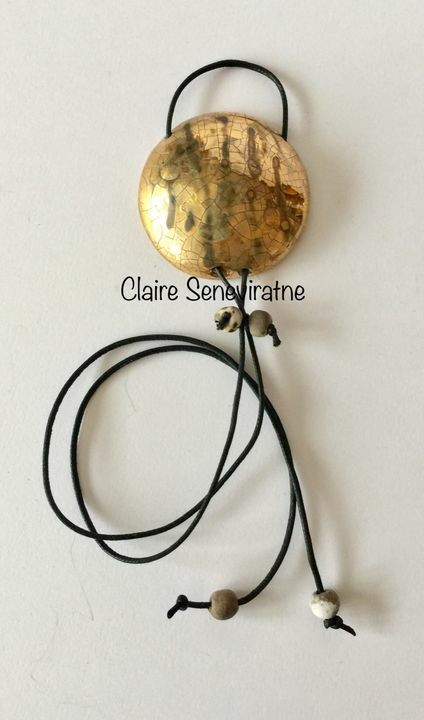 Claire Seneviratne - Ceramic Artist: Large statement gold raku pendant. Large statement gold raku pendant. This round gold pendant is made from porcelain and has been fired twice in my electric kiln. The gold lustre has crackled and I have also added some copper carbonate which has reacted with the glaze in an exciting way. The pendant is attached to an adjustable cotton cord. The bead knot below the pendant can slide to change the cord length. The beads are also hand made and smoke fired in sawdust.